Perhaps this will be useful for some people. I have made a "Spout" sender dll based on the user example in the GeexLab sample pack. This allows the shader output to be shared with any Windows Spout receiver application such as Resolume and TouchDesigner. The links to the dll have to be put into each individual shader xml file which is not all that convenient, but it does work OK. I have only tried this with examples originally from ShaderToy, but hopefully others will work OK if the dll is compatible. There is also code included that activates "SpoutController". So if you run "SpoutController.exe" when the shader is running, you can use slider controls to adjust the mouse and speed variables. This is experimental at this stage and can be excluded from the shader itself and then will not have any effect. Maybe this will be of interest and somebody might extend it further. A 64bit working example is in the "GLSL_Spout" folder. If you want to recompile it, have a look at the comments. I can't guarantee that the VS2012 project will compile straight away but it shouldn't take too much to get it working. Thanks for your contribution Lynn! Thanks JegX, I hope this proves useful for people. I had this in mind for a while but never got around to completing it. That article on HackLab is excellent. 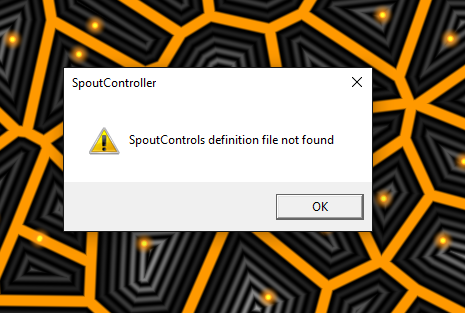 Yes the SpoutController isn't working properly. It's looking for a control file because I forgot to create the controls in the first place within the plugin. It works for me because the file already exists. I am trying different things at the moment and I will think about it. Meanwhile it isn't important and won't affect the plugin binary. I think I will make a basic version of the plugin and an experimental version. I will post here when the basic version is complete. A basic version is done. It is a very simple dll now and easily incorporated into the shader code. I will keep looking at the possibilities for the Spout controller. If at any time you want to look at this further, just contact me.